From graduation to post-graduation and advanced courses, each group of higher education applicants has a unique set of needs and objectives to be achieved, when it comes to finding and selecting the right institute. 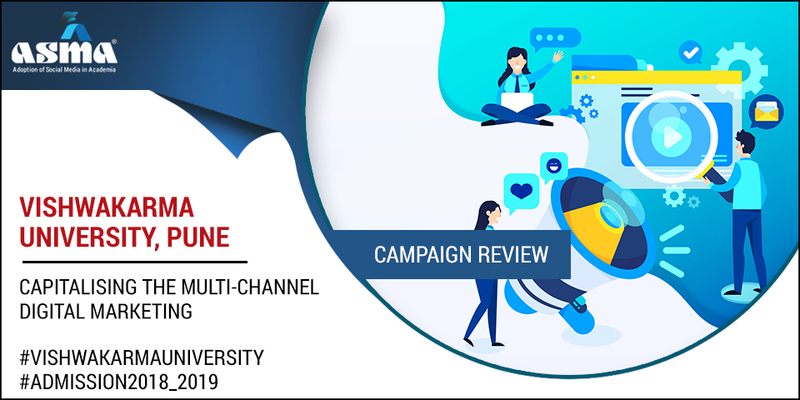 Institute who understand these needs, can easily with multi-channel digital marketing methods approach, nurture the reach, consider awareness to convert the potential candidates into admissions. Digital Marketing with its huge scope, have strategic solutions to drive up multi purposes of higher education. Increase admissions over 2017 intake. Build awareness of the University pan-India. Promote our mission of holistic education with a balanced commitment to the sciences, arts, and humanities and an interdisciplinary way of study. Digital transformation through Social Media for the entire Group started a good two and a half years ago. Employees are the best advocates of a company and Vishwakarma has 1500+ advocates. A well-structured plan was put in place and a process to cascade the message of the importance of Social Media and its use, was rolled out over the next two years to our 1500+ employees. Through sustained development and leveraging of Digital Assets for each of the Groups entities we organically increased our digital presence. Offline/print media marketing may not be the best option given that our efforts did not produce results commensurate with the kind of spending. It was debatable if our target audience, which is 12th standard pass students in the age of 17 to 21 years, had even seen the advertisements. Even if there was awareness created, this effort did not translate into admissions in the numbers expected and in relation to the spend. Throughout our campaign for Admissions, there was a focus on relevant content/SEO for courses, website, landing pages, and all social media assets. As content would be continuous, strategy and tactics were looked at for the quarter. They studied competition and other practices in the academic circle. They have benchmarked themselves against an entity we felt we were closely aligned to. They have covered courses offered, events, student engagement, industry engagement and placement, knowledge shared, MOUs with various global universities etc. The existing Vishwakarma Educational Institutes have an unmatched presence in the field of engineering education. We needed to move the narrative away to our strengths in other areas, for Vishwakarma University. Knowing that we now had a good presence on Social Media, having started the exercise a good two years prior, our approach was multi-channel. We did not dive straight into the campaign but analyzed the previous year’s efforts. Facebook was chosen to promote new and advanced courses offered by the university. The beauty lies within the representation of post on Facebook, with attractive banner and creative content that has accelerated the students’ engagements. Twitter engagement is slightly on the higher side than Facebook on these posts. Majority of people are actively participating via retweeting the same content. The weekly analysis of the Admission dashboard along with website analytics. Analysis of source of inquiries, course interest analysis, CPC analysis (lowering or raising budgets for spend). Constant corrections made where, and if required.